Fewer Than 6 In 10 College Students Graduate In Six Years To unlock the benefits of going to college, you need to earn a degree. But average completion rates in the U.S. are surprisingly low and can vary widely depending on what type of school you attend. While the numbers are up overall, experts say they're far too low and can vary widely depending on what type of school you attend. On average, four-year private schools graduate more students than their public counterparts. Two-year community colleges and for-profit four-year schools have average completion rates below 40 percent. In other words, about 6 out of 10 students who started at those schools will not have a degree after six years. Many will be saddled with student debt without the earning potential to pay it off, and they're more likely to end up in default. And let's not forget, we're talking about six years. "Those years represent real costs in both money and time for students," explains Julie Peller, executive director at Higher Learning Advocates, a higher education advocacy organization. "They are not only paying more in tuition, but they are not seeing the economic return of a degree or credential." Which inevitably leads to the question: Why are so few students graduating? "A fundamental reason is that many institutions have not adapted to serve today's students," explains Mamie Voight, the vice president of policy research at the Institute for Higher Education Policy. Students are more diverse than ever, racially and economically. They're working part-time and are often struggling financially, she explains, with college affordability as a major factor in their success. Colleges and universities are typically designed to serve full-time students attending just one institution, despite the fact that their students are often working and taking classes part-time. And while the number of part-time students is growing, completion rates for these students are quite low. On average, across institution types, about 1 in 5 part-time students finished a degree after six years. Surprisingly, the use of completion rates as a measure of success in higher education is a fairly recent development. The availability of good national numbers started as recently as the early 2000s. As more data became available, institutions and policymakers began focusing on graduation rates. In 2015, the Obama administration created the College Scorecard, a database that highlighted completion rates by institution. Schools re-evaluated their own numbers — and many are working to improve them. Some of those efforts are paying off. The current overall six-year completion rate — 58.3 percent — is up about 1.5 percentage points from the cohort of students the year before – those who started in 2011. "We're seeing increases literally across the board," says Doug Shapiro, research director at Clearinghouse, a nonprofit that tracks and publishes student data. The increase shows up across all demographic groups, all racial and ethnic categories, and all ages — including older adults. "More college students are actually finishing a degree, which is very good," Shapiro says. Students themselves deserve some credit for the improvement, he explains: "They are much more focused on their own success because they're more and more concerned about their ability to repay debt and find gainful employment when they finish," he explains. But he doesn't think students are as aware of these graduation rates as they should be. Nor are they aware how much their chances of graduating can be affected by the choice of school they attend. "It's hard to talk about graduation rates with new students because no one thinks they're gonna be the one who doesn't graduate," he says. It's a challenge, Shapiro says, but incredibly important. Another reason colleges are working to improve their completion rates: tighter competition for a shrinking pool of students. College enrollment is down for the sixth year in a row, thanks to a flatline of students graduating from high school across the country, a good labor market and low unemployment. "Every student who drops out is one less student that you have," Shapiro says. "Institutions are focused on retaining the students that they have because it's getting harder and harder to find new students." The data shows that Asian and white students are more likely to get a degree than their African-American and Hispanic classmates. For all black students who started college in 2012, just 41 percent earned a degree in six years. For Hispanic students, it's 49.5 percent. Much of that discrepancy is related to where black and Hispanic students tend to go: community colleges and for-profit schools. In most cases, these are "open access" schools without competitive entrance, and they tend to have fewer resources and support services. Since those schools have the lowest completion rates, it's not surprising that demographic data is similarly impacted. Mamie Voight, of the Institute for Higher Education Policy, notes that there are also wide disparities in these numbers between schools. In other words, "what institutions do matters," she says. 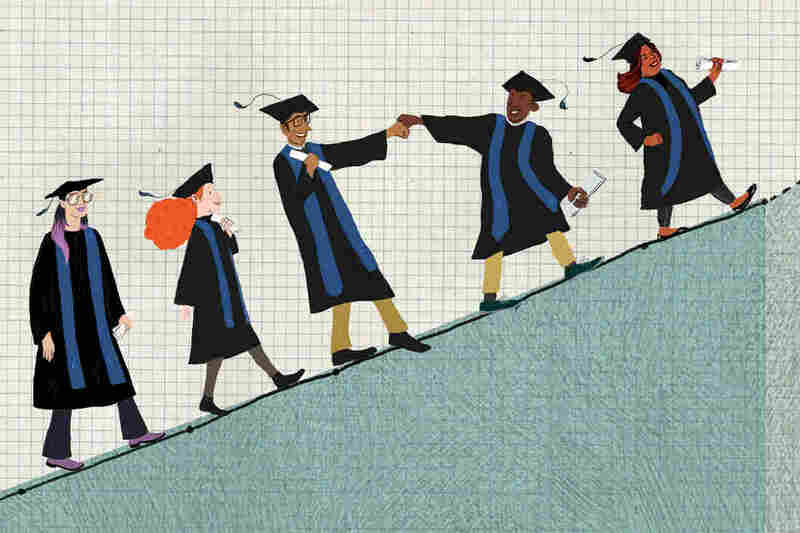 "We routinely find that some institutions do a better job at graduating students — especially low-income students and students of color — than others," she says. Targeted policies, such as hiring more advisers or providing small grants to help student cross the finish line, can make a big difference. Schools such as Georgia State University, for example, have been able to increase completion rates using data and advising to target at-risk students. What if we give students two more years? The National Student Clearinghouse also looked at the eight-year completion numbers for students who started in 2010 — essentially giving students two more years to graduate. What did they find? The rates increased — but only by a relatively small amount. Overall completion rates rose from 54.8 percent to 60.4 percent. For part-time students, the numbers went from about 21 percent earning a degree in six years to 23 percent in eight years. "Extending time to a degree doesn't solve our graduation problem," says Davis Jenkins of the Community College Research Center at Columbia University. He says that while the numbers did go up, they didn't go up that much. The data also show that after eight years, only 6.5 percent of students were still enrolled in school, so more time wouldn't help the other 30 or so percent who already had dropped out. Jenkins also notes that despite the increased time, on average — across sectors — about 40 percent of students who start college don't finish. And that's clearly not good, he says. "We tell students that college is four years," Voight says. "That's what students and families plan for and expect." She says the solution isn't "shifting our standard to double that normal time," but instead, schools and policymakers should find ways to help students graduate on time.